Introduction to Comics Writing-SOLD OUT! This is our third sell out in a row and that is awesome news. Don’t get me wrong, I’m thrilled that Comics Experience is getting stronger all the time, but what’s so awesome is the students coming in are so enthusiastic that I’m more excited to go edit and write my own comics after a night of class or an afternoon reading their work or reviewing their art. This is really thrilling stuff, and it’s totally contagious. Our first class for this round of “Introduction to Writing Comics” is this Thursday. Just about everyone in the class has joined our online Google Group and has started swapping stories about their love of comics or interest in writing. As always, it looks to be a diverse group, which is fantastic. All these different approaches and experiences with comics lead to different points of view and approaches to telling comics stories. The students in these courses learn a ton from each other and they learn a lot from the course. They’re designed to be completely immersive. And the amount of learning and creativity is just exilerating. The only downside right now is that I’ve got to wait all the way until Thursday to start the class! If you’ve ever considered taking one of these courses, sign up for our email newsletter at www.comicsexperience.com or I always announce them a couple of times over Twitter. You can follow me on Twitter, too. I’m @comicexperience. Sorry for the delay in recent posts, folks. I've been buried at work at IDW due to circumstances I can't talk about yet and on top of that, I've got deadlines looming for two different writing projects that are just stressing me out. I'm not off the reservation, just working hard. Got a couple of cool things to show you soon from the Coloring course that just wrapped up though. I hope to write that up tomorrow. 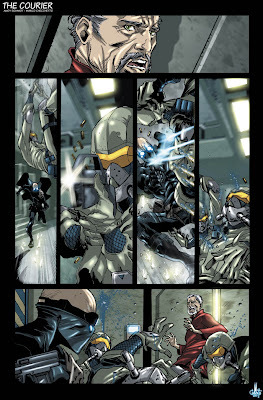 In the meantime, I thought I'd post a couple of images of an old creator-owned project I developed with current AMAZING SPIDER-MAN and DAREDEVIL artist Marco Checchetto. They aren't in order, really, so it probably won't make any sense. But, man, they're pretty. 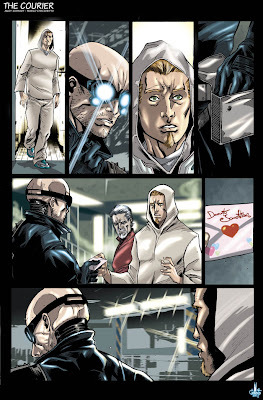 This was back before he started working for Marvel. Great guy. Be sure to pick up his Marvel's books! Stuff like that is always fun and it lets you know I'm not lying. I really do work a lot! Robert Kirkman coming to the Book Club! 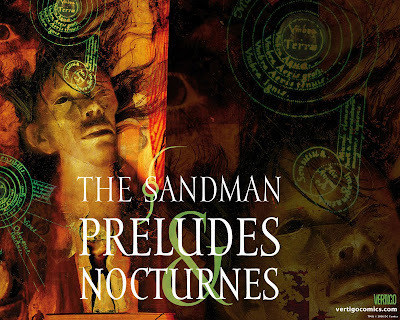 We had our second Book Club last night and we talked about the first volume of SANDMAN by Neil Gaiman and Sam Keith. It was great. But don't take my word for it. Here's a link to a blog one of them members keeps! He wrote all about it: Comics Experience Book Club Review. And for those intersted in joining in, next month ROBERT KIRKMAN is going to join us personally to talk about THE WALKING DEAD volume 1! Join us and have a great time on a night to talk with Robert directly and find out just what kind of mind comes up with THE WALKING DEAD and INVINCIBLE! Click here to join the Comics Experience Book Club! Hope to see you on Tuesday, March 9th to talk with you and Robert! NEXT MONTH: THE WALKING DEAD! COBRA II off to a great start! 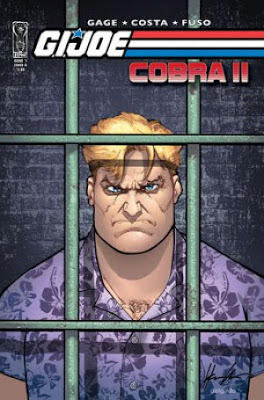 GI JOE: COBRA II #1 not only sold out, it's met with fantastic reviews! Here are a couple to check out. 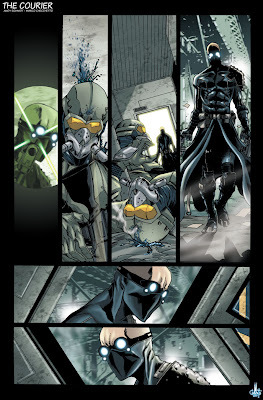 And if you haven't gotten the first issue, shame on you (but a second printing is in stores this week, I believe!). Go get it! It's pure awesome! There. It's not just me sayin' it. The whole Internet likes it! Buy it, darn you! BUY IT!!! I've spent the last two days in 9-5 business meetings with a new partner of IDW's. I can't talk about what it's for, who it is, or any details whatsoever yet. Announcements to come, I'm sure. But what I can talk about briefly is the experience of meeting with a new partner for the first time. With any partnership, it's a lot like a first date. Lots of questions, very few answers. And on top of that, there's the added drama of not knowing if the person you've known up to this point is the real person underneath. These last couple of days couldn't have gone any better. The best way to approach a partnership is with an open mind and total honesty. That doesn't mean anyone should be a jerk, but being honest about one's thoughts and opinions is a good thing. There's a bit of an art to how some of those opinions are presented. It's always a good idea (and this applies to talking with an editor if you're a freelancer or when speaking to a freelancer if you're an editor) to bring up a problem or potential problem ONLY if you have at least one idea on how to fix it. If you bring up a criticism, also be upbeat about something you do like. In this case, these last couple of days, the new partner was extremely open. Offering us looks at materials not yet released to the public, not yet announced to the public in some cases. Very open about exchanging ideas and potential crossovers with promotions and such. Above all else, they were excited about the partnership and their own projects. It's infectious. Five minutes in the room with them and I was excited too. They really had the three key ingredients for a good partnership (company to company or person to person). With any partnership, no one party is going to control everything. Both need to be open to the other's desires and wishes. In this case, that was clear from the first hour of meetings. Just a constant flow of ideas from both parties. They walked us right into their new project launches, the publicity pushes, and the big events they've got planned. In turn, we did the same with our own. It allows both groups to begin to plan together and builds a level of trust immediately. They've got my secrets and I've got theirs. That's hard to do. And, again with any partnership, we're in it together. And that was made clear also. We're going to be pooling our resources. And that's a really great feeling--to know that the real experts are excited about the partnership and willing to helps us make a better project for them. It makes it a lot easier for us both to know that the other is there to lend a hand when needed. Anyway, that's the way I see it. It's funny how many things in life are made easier by being honest, open to new ideas or ways to do things, and the simple willingness to lend a stranger a helping hand.